Frozen foods are fast and convenient choices when you're hungry for a meal or snack, but they're not always healthy. The key to finding healthy frozen foods at the grocery store is to look beyond the packaging that says "fat-free" or "no added sugars" and instead look at the nutritional label. Choose foods that are relatively low in saturated fat, sodium and calories. Nutritionist Elizabeth Somer suggests choosing frozen foods that supply at least 2 to 3 g of fiber, less than 200 mg of sodium per 100 calories, and less than 1 g of saturated fats per 100 calories. Pizza is a staple in many homes, but many of the frozen pizza brands found at your grocery store are loaded with calories and saturated fat. The editors at "Fitness" magazine suggest switching to a thinner crust, low-calorie alternative. They recommend trying Palermo's Primo Thin Margherita Pizza, which is low in calories and loaded with tomatoes and spices. Eating one-third of the pizza contributes just 260 calories to your daily caloric intake. A frozen pepperoni pizza with an equivalent number of calories is the Pacific Natural Foods Fire-Baked Thin Crust. Veggie burgers, such as Boca Burgers, are an excellent source of protein and fiber. They are made from soy products, although they taste surprisingly similar to traditional beef burgers. Unlike beef burgers, however, Boca Burgers contain 0 g of saturated fat. Additionally, each burger patty is just 70 calories, and contains 13 g of protein and 4 g of dietary fiber, according to the company website. 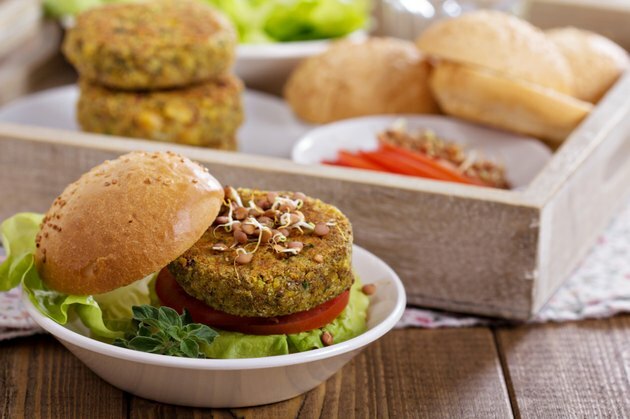 There are several varieties of veggie burgers to satisfy just about anyone's taste buds, including spicy, grilled flavor and specialty flavors. The Library of Congress dates the introduction of the first frozen dinners all the way back to 1945, though Swanson coined the name "TV dinner" in 1954. TV dinners continue to be a convenient and quick way for people to have dinner ready, from freezer to table, within a matter of minutes. TV dinners have come out with healthier versions over the years. Kashi's All Natural Chicken Florentine is a healthy choice, according to Good Morning America Health, containing just 290 calories. For seafood lovers, try Organic Bistro's Wild Alaskan Salmon dinner, which is 390 calories and chock-full of omega-3 fatty acids for heart health. A staple in American homes, frozen French fries can be healthy if you choose the right kind. Choose fries made with no trans-fat, such as the Alexia Sweet Potato Fries. These particular sweet potato fries are lower in both saturated fat and sodium. The Alexia Oven Fries contain just 140 calories per 3-oz. serving. Sweet potato fries offer a tasty variation to the classic taste of French fries. Library of Congress: Who “Invented” the TV Dinner? Is Oprah Winfrey's New Cauliflower-Crust Pizza Good for You?